The blog's purpose is to serve as a tool for facilitating further conversation as well as offering additional clarification regarding course materials or other related issues. If you have comments or questions please click below. So how much does our own personal experience influence the way we form our theological ideas? I like to think that the primary reason I hold certain theological ideas is because I have carefully studied the Bible and my theological views are consistent with what I find there. 1) There is the Bible and then there is my understanding of the Bible. My understanding of the Bible is theology, not the Bible. The Bible stands over my theology and judges it, thus the need for humility when announcing my theological ideas. 2) All theology is ultimately biography. In other words, it flows out of my life with all of its twist and turns and inconsistencies. I did not receive my theology from an angel, or a burning bush. It did not drop out of heaven as a travel drive already formatted with everything carefully and systematically organized. Yesterday I had an experience that reinforced my impression that our personal experience plays a significant role in shaping our theological views. I am not suggesting that our experience shapes our views for good or bad per se, but it certainly provides us with a perspective that can be true but not complete. I’m teaching a theology course and we were discussing eschatology, Christian ideas about what the end of all things will be like, or, as I like to call it, “speculative theology”. The conversation turned to how our views of God’s kingdom influence the way we view the world and our purpose here in light of God’s final purposes. do we address the many problems afflicting this world applying biblical principles of justice and peace? Two of my students found themselves on different sides of this issue, though their stated views were nowhere close to the hyperbole I used to define the conversation. At first the conversation focused on attempts to reconcile the mandate of evangelism with Jesus’ teachings and the OT prophets’ call for justice, but, toward the end, both students shared that their views were heavily influenced by their experience. One comes from a denomination that so focuses on getting people to heaven that social justice issues are seen as, if not a waste of time and resources, a diversion from our primary purpose of getting people saved. This student found this focus shallow, narrow and far short of Jesus’ teachings and the OT prophets’ call for justice. The other student came from a denomination that had so allied itself with the social and political issues of a minority community that it had uncritically adopted the religious views of that community (these views were essentially pantheistic) in order to create a feeling of solidarity. These students realized that we were not just talking about the Bible, Jesus, or the OT prophets. They were dealing with the personal experiences that had shaped their understanding of the Bible. Once they each shared their experience there seemed to be an “Oh, okay I see…” moment. I can’t help but wonder what would happen if many of the visceral and mean spirited conversations happening among Christians would change if we were willing to come clean and share the experiences that are often at the heart of the “Bible truth” we believe so strongly? Well, I have made my home among Baptists for over 30 years now, in particular, Southern Baptists who took that name in Augusta, Georgia in 1845. This name ceased to be a strength some time ago except among the faithful but attempts at renaming are futile owing to the fact that sub-cultures are powerful entities. I am currently teaching a course on Baptist History and have been reminded why I consider myself a Baptist but with a “small b”. Baptists tend to the be the step-children of Protestantism because we don’t have a founder (contrary to the opinion of some Baptists that we were founded by either Jesus or John the Baptist). We can’t point to Martin Luther, John Calvin (contrary to current trends) or John Wesley. If you asked Baptists about their historical lineage they would either look puzzled or perhaps refer to Roger Williams who was a Baptist for about 6 weeks, maybe. If we were to answer that question we would need to mention well known figures like John Smyth, no not the Pocahontas John Smyth, the other one; Thomas Helwys, Andrew Fuller, William Carey, Richard Furman…is this ringing any bells yet? I thought not. So what makes a Baptist, well, a Baptist? I have listed below what I consider Baptist’s distinctions. 1) The Bible- Reference point, authority for belief and practice. 2) Believer’s Baptism, not infant baptism. 3) Gathered Church, the church consists of those who gather based on their mutual faith in Christ. 4) Dissenters- On principle, against the status quo and therefore prophetic. 5) Freedom of Conscience- Value of the individual soul and the community of faith before God. 6) Revivalism- Power of the gospel and a focus on evangelism. 7) Missions- Conviction about the “Great Commission”, to all people. 8) Institutions- Centralized stewardship of resources for God’s work. What have been the challenges that continue to plague Baptists? 1) Lack of a clear theological and historical identity. 2) Inability to communicate among ourselves leading to a lack of grace and trust. 3) Personality centered leadership, autonomous leaders who lack accountability while exercising power. 4) Tendency to fight when theology becomes an issue with love becoming the first casualty. 5) Insulation from the wider culture as though an independent sub-culture can be the culture. 6) Dependence on institutions and organizations not on each other/God, we like being big. 7) Lack of flexibility and thoughtfulness in the midst of internal crisis. So how will Baptists make a positive contribution to the future? 1) Discernment: Increased reliance upon the Holy Spirit for guidance in developing a comprehensive approach to life’s issues that promotes engagement with our world. 2) Community: Committed to dialogue and a search for truth and unity that allows for theological diversity. This kind of community will require that we embody our faith in Jesus Christ. 3) Visionary Leadership: Story tellers, not autocrats. Leadership that is shared, accountable, and dynamic. 4)Unified Point of Reference: Commitment to the Bible as a truthful description of the fundamental nature of the universe, interactive and relational. 5) Cultivate a spirit of humility and meekness that creates an environment of grace and mercy. Robert Putnam’s book Bowling Alone was published in 2000. In it he documented how Americans were increasingly becoming an isolated people, disconnecting themselves from friends, family, civic groups, religious affiliations etc. It would seem that if Americans value choice among all other values and we equate choice with true freedom, then we are not only the freest people on the planet but we are choosing to be alone. If you have developed a habit of eating cold pizza while standing over your sink pondering what to do with the rest of your life you’re validating Putnam’s research. Then again there is the recent work done by Bill Bishop, The Big Sort, and Dante Chinni and James Gimpel, Our Patchwork Nation. These two books suggest that we are not becoming Lone Rangers, we are becoming Segregated Rangers. According to these authors Americans are becoming more isolated but they are doing so in communities. We are intentionally creating sub-cultures identified by specific socio-economic, political and religious distinctives. We want to live, work, play and worship with people just like us and do so in communities where our contact with those “other people”, variously defined, is reduced to a minimum. So what’s the point? Well, I have recently had more alone time than normal while also being among some people who are not part of my normal everyday interaction and I have thought about how other people play such a critical role in helping us interpret our life’s story. Left to interpret my life by myself I am often puzzled and bewildered by the disconnected and seemingly chaotic nature of what life brings to me each day. Sometimes life seems to make sense and then circumstances change, people change, change happens and I am forced to re-calculate and re-evaluate my sense of things. I confess that this can become a very tedious and tiring exercise…if I am the only person in the story. I realize that when it comes to interpreting my life and finding the meaning in it, neither of the two options I listed above are healthy options. Using myself as the only reference point for understanding my life is the path to a solipsistic existence where I don’t just have a story but I become the story where everyone else becomes a minor player just waiting for me to give them their que to enter the scene. When I join a segregated community of people whose only real value is that they look and think just like me is to make exactly the same mistake with the only difference being that I have helped to form a self-centered community that reinforces my own biases. In both cases I have successfully protected myself from the one thing that makes interpreting life possible, personal transformation. If I want to know how and where my life has meaning I will need to look for those places where I am being transformed, not where life is changing around me but where I am being changed. The places where that happens is most often the places where I risk opening myself up to life and to others, others not like me, others who are allowed to speak into my life. What I have tried to describe is the life I think Jesus has called me to live and I hope I have described the nature of what the church is supposed to be as well. Following Jesus is an challenging life of trust, faith and hope where we continually open ourselves up to the places and the people where God places us. That’s where the transformation happens, that’s where the meaning is found. If you want to know what your life means you can’t spend it protecting yourself. At the seminary where I am teaching we just spent a week with three representatives from Chick-Fil-A. You know, the commercials where the cows tell you to “eat more chicken!”; the company that closes on Sunday and still kills their competition who insist on staying open 7 days a week; the business that malls will allow to close on Sunday in spite of mall rules to the contrary (because they make a profit anyway); the 3 billion dollar corporation that makes the greatest chicken sandwich in the universe. Yeah, those guys. Well, we spent a week talking about leadership because leadership is what matters. You can make a great chicken sandwich but without great leadership, well, you just have a great chicken sandwich. So we talked about the 5 secrets of great leadership that are not so secret. It just seems to be true that the qualities of a great leader are never secrets, they just require more of most leaders than they are willing to be or do. 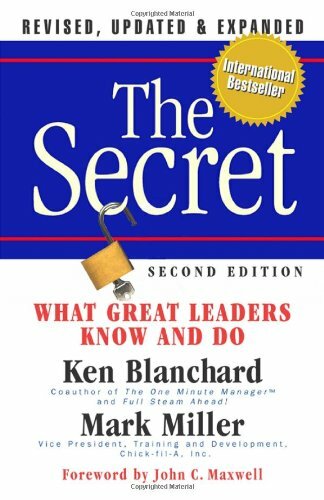 For the week we used the book, The Secret: What Great Leaders Know-And Do co-authored by Ken Blanchard and Mark Miller. So, I am going to spoil the book by telling you the secrets. Here they are. If you don’t want to know so you can read the book, stop reading right now. And there are actually 6 secrets not 5. Great Leadership is 80% character and 20% skills. You can teach new skills but character is character. Great Leaders see and shape the future. They can create and communicate a compelling vision of what can be and lead others toward it. Great Leaders engage and develop others. The future is not about the leader, it is about the leader’s ability to recruit and select the right people for the right jobs while creating an environment for those people to grow and reach their potential. Great Leaders reinvent continually. Status qou is not a path to the future. Change must be anticipated and embraced as an opportunity for improvement and growth personally and professionally. Great Leaders value results and relationships. The trick is knowing which of these two you are more inclined to focus on and then find ways to intentionally compensate for your natural bias. Great Leaders embody the values. They live what they value, they walk the talk, the proofs in the pudding, you know. Like I said, these are not secrets. They are just characteristics of great leaders. So why do you think we always have a shortage of great leaders? You can’t fake leadership because it’s who you are, not the person you want people to think you are. I am currently teaching Christian Theology to seminary students and the first topic out of the gate was the Holy Spirit. Of course it is nigh on impossible to discuss the Holy Spirit without covering the doctrine of the Trinity, and here we go. Trying to adequately talk about God is tough enough and then you have to talk about God as 1 and 3, 3 and 1; God existing as Father-Son- Holy Spirit. First of all the math doesn’t work, at least my pitiful tenth grade algebra math doesn’t work. I am still looking for X and wondering where X came from in the first place. X needs a home and I was never, ever, able to find X a home, thus my D in algebra, but I digress. I am sure that somewhere out there in cyber-land there is a quantum physicists for whom the math of the Trinity is not a problem at all, but it is for me. That is why I choose not to dwell on the mathematical language of the Trinity. Instead I focus on the what I think that the math suggests, that God is in fact a mystery. Not a secret, but a mystery. I tell my students that trying to explain the nature of God as Trinity is like trying to describe how coffee smells to someone who has never smelled coffee. Think about that a moment. My point is that both our language and our ability to use language is limited, especially when faced with a reality like God. As I said, God is a mystery, not a secret. We have the record of God uncovering His hiddenness in the Bible, and His clearest and greatest revelation was when God became one of us in the person of Jesus Christ. That being said, our task, the task of theology, is to use language to communicate God’s revelation of Himself. Theology happens when limited people using limited language confront the mystery of God revealed and give their best effort to communicate that mystery to others. That means that Christian theology is the business of everyone who claims to be a Jesus follower. Every follower of Jesus who claims to have met the God revealed in Jesus Christ is responsible for telling the story of that meeting to others and explaining how God is Father-Son-Holy Spirit. Some would say that to do theology well a person needs years of theological training and a PhD wouldn’t hurt either. Yes, theological training should be offered to every follower of Jesus. The Church should be proactively preparing all Jesus followers to understand and communicate their faith effectively. I agree with Karl Barth that theology is the business of the Church, not professors. Having said that I would suggest that the primary characteristic of an authentic theologian is not education, it is humility. Education is no antidote for arrogance or pride. Providing an arrogant, self-serving and prideful person the opportunity to communicate the mystery of God is like handing my 5 year-old grandson the keys to my truck and telling him to run some errands for me. He could probably get it started and drive it down the street but not without causing some major damage to himself, the truck and other people. An earned PhD does not guarantee wisdom or humility anymore than refusing to be educated on the grounds that you only need the Holy Spirit to be smart. Theology is about humility. It is approaching the mystery of God with an open heart and a willingness for God to teach and transform us even as we attempt to use limted language to explain to others how God can be 3 and 1 at the same time. In 1963 Harry Blamires wrote a book titled, The Christian Mind. Blamires was the Dean of Arts and Sciences at King Alfred’s College, now Winchester University. He was an Anglican and a theologian of the best sort, not a professional theologian just a practicing Christian who understood that he had a theology and therefore sought to think it and live it in a self-conscious way. C.S. Lewis was his tutor so I suppose it would have been difficult for him not to take his faith seriously. Blamires’ book focused on one essential point, the absence of what he referred to as a thorough going Christian mind that actually inhabited the world and engaged it at every level of human existence. There are Christian ethics, practices and spirituality but where is the Christian mind, alert, sharp and attuned to the pressing cultural issues of the day? He was not arguing for Christian politics, the creation of a Christian political party for example, but he was wondering why Christians tend to inhabit a personal and private world of spirituality that encourages them to leave a robust supernatural faith at the door with their hat and coat upon entering the “real world”. He is also not suggesting the creation of a special category of public discourse labeled ”Christian” so that whatever subject is being discussed someone can offer the alternative ”Christian answer”. C.S. Lewis touched on this point when he wrote, “What is needed are less books on Christianity and more books by Christians on other subjects.” Alas, a tour through most Christian book stores would confirm Lewis’ contention that Christians write for Christians and leave others to shape the conversation on most every other topic that the culture cares about. He is asking why Christians tend to lack both authority and respect when speaking on topics that fall outside the realm of religious issues. He is wondering, as I do, why there seem to be so few public intellectuals who are professed followers of Christ helping to shape the cultural agenda of our day. It leaves one with the distinct feeling that in the realm of public discourse Christianity is privately engaging but socially and intellectually irrelevant. Perhaps it is time for Christians to cease the senseless segregation of religious and secular and start engaging the world not as a secular place but as the world for which Christ died. For centuries Christians have theologically argued for the full humanity and full divinity of Christ with no separation or division of Jesus’ human and divine natures. What would it mean if each of us lived the theological implications this understanding of Jesus offers us? As his followers how would would we address our world and its concerns? How would speak into the public discourse of our day? Rather than offering a ”‘Christian answer” perhaps we should seek to bring the weight of our faith into the conversation and offer a better, more thoughtful and more human answer; an answer that blesses others and honors God. Again this year I listened to “Christmas music” on a local radio station from just before Thanksgiving until the day after Christmas. Each year this station insists on playing some artists over and over and over again ad nauseum. This year it was Dean Martin and, of course, Elvis. One more round of Blue Christmas or Rudolph (Rudy) and I was ready to lose what was left of my Christmas spirit. But there was one song I always look forward to because it’s kinda fun. Unfortunately Dean Martin recorded that one too. As I listened to this familiar song I was reminded how history can get lost, rewritten or repackaged in a way that creates a memory, picture or image that bears no resemblance to the original event or story. I am not saying that these alterations are intentionally malicious, bad, or demand that we rectify the situation immediately. I’m just saying that it happens regularly and we are usually unaware. The song I am referring to has always been associated with the Christmas holidays. I am not sure why except for the fact that I never heard it except at Christmas. Walking through a department store shopping for gifts, at a party, listening to Dolly Parton’s Christmas Album or watching the Andy Williams Christmas Special (which dates me as prehistoric) etc. etc. So, in my mind, the history of this song was always associated with Christmas time, with cold weather, with snow, and people in love at Christmas time. That is what the song’s writer intended, right? That was the right historical framework for this song, right? It was written for the holidays, right? The song I am referencing was written by Frank Loesser. Frank was a popular song writer and composer who is best known for writing Broadway musicals like Guys and Dolls and How to Succeed in Business Without Really Trying. In the late 1940s he wrote a duet for he and his wife to sing at cocktail parties all over Hollywood and New York. His wife often commented that it kept them in caviar and truffles for years and she considered it “her song”. So, the song was written to sing at parties any time of year. It had nothing to do with Christmas or the holiday season or snow or cold weather, but it was about two people in love. Frank later sold that song and somehow over time it morphed into a song sung on Christmas albums and in holiday specials and associated with snow etc. Have you guessed the song yet? Click and listen below, enjoy! A significant portion of our culture is about to celebrate Christmas and that celebration will happen for any number of reasons, many of them having no connection to the religious meaning of Christmas. I am not suggesting that celebrating Christmas for reasons other than Jesus’ birth is bad, meaningless, poor form or other such complaints. I like Santa Claus, Rudolph, Frosty, the Grinch, Scrooge, decorating trees, putting up lights, Elf on a Shelf, A Christmas Story etc. etc., but I would expect Christians to recognize the critical relationship between Christmas and doctrine. Christmas is about the Incarnation which literally means that something became flesh. In this case Christmas is about God invading our world and interrupting our lives in the form of a baby boy who grew up to become the God/man we know as Jesus the Christ. The incarnation is powerful stuff. This is not everyday news, it is truly good news. The incarnation was a one time historical event that inaugurated a new age punctuated by Jesus’ resurrection from the dead and his promise to forgive and reconcile to God everyone who would trust in him. It may seem an obvious observation but I will make it anyway: no incarnation, no resurrection. I find profound significance in the fact that Luke’s gospel does more than tell us about the birth of Jesus. Far more powerful for me are the first two verses of chapter two. These verses tell me that Jesus’ birth occurred during the reign of Ceasar Augustus when Quirinius was governor of Syria while a census was being taken throughout the Roman world. These verses confront me with the fact that God is fully engaged with history, that history matters to God and not just the history connected to Jesus’ birth but all of history matters. Our history matters to God. The implication is that my life matters and your life matters and what we do with our lives matter. The choices we make and the way we treat each other matters. When Christians talk about knowing God through Jesus Christ they are not verbally and intellectually leaving the world and entering some spiritual realm. They are claiming that their faith is rooted in this world, directly connected to it and that there are immediate and profound consequences for living a life committed to Christ. Christians are claiming that history can and will be changed because of their faith in Jesus. Of course we may not live as though God is at work in history but let’s at least be clear that’s what we are claiming. Following Jesus is not primarily about getting to heaven, it is about living a life that matters now. That is why Christmas is about the incarnation when God decided not to live apart from us but to move into the neighborhood with us proclaiming His intent to change the world and its history through us. Yesterday was the sixty-ninth anniversary of the Japanese attack on Pearl Harbor. Pearl Harbor was one of those events that it would not be an exaggeration to say that people woke up the next day to a world that was decidely different and, over the next four years, that world would continue to change in ways that would make it appear very foreign indeed. America entered World War II as an emerging world power; it exited World War II as a global leader exercising significant economic, military, industrial and political power. America entered the war as a conventional military power; it emerged as a nuclear power. The America that emerged from World War II was the one that I and many other “baby boomers” were born into. Postwar America was a country committed to progress, prosperity and the notion that every American should receive a college education, hold a good job, own a nice home and drive a new car. After World War II America became, in essence, a consumer’s republic. If you are wondering how, why and when we initiated an economic trajectory that would result in one-third of our GNP being dominated by consumer spending, examine the government’s role in marketing the notion that mass consumption was not only in the best way to achieve the general welfare but was synonymous with patriotism. The “American Dream” that politicians continually refer to today was created in the postwar period as a way to sustain the level of economic and political power and influence America achieved during and just following World War II. 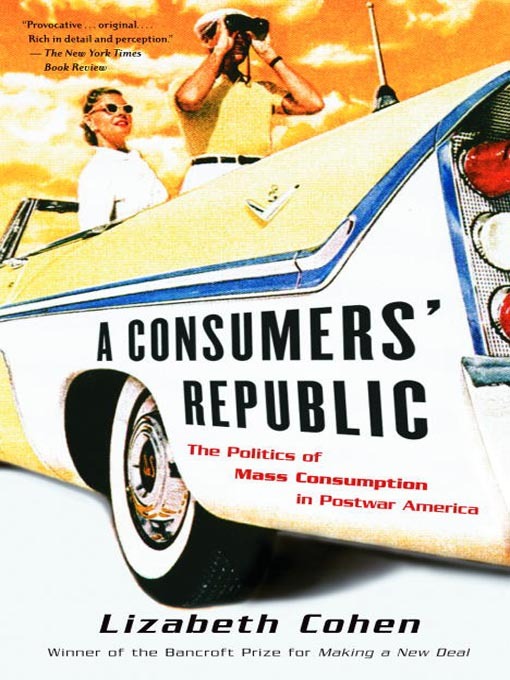 If you are interested in reading more about the creation of the postwar “American Dream”, read Lizabeth Cohen’s A Consumer’s Republic: The Politics of Mass Consumption in Postwar America. Oh, and just for fun, did you know that the day after Pearl Harbor F.D.R. was driven to the capitol to make his famous speech in Al Capone’s armored Cadillac? The Secret Service needed an armored car to transport the president but could not afford $750 to buy one, so an agent suggested that they use Capone’s car since he was in prison for tax evasion. It had been painted black and green to look identical to Chicago’s police cars at the time, had a specially installed siren and flashing lights hidden behind the grille and a police scanner radio. The 1928 Cadillac 341A Town Sedan also had 3,000 pounds of armor and inch-thick bulletproof windows. The recent furor over the Wikileak revelations regarding diplomatic communications reinforced for me many of the reasons I am not a professional diplomat and would never be effective as a professional diplomat. Simply put, I lack the patience and or the willingness to hear and see inane and senseless behavior while remaining cool, calm, collected and seemingly unaffected by inane and senseless behavior, especially if people’s lives and security are at stake. I have not read large portions of the leaked correspondence, but what I have been exposed to confirmed my suspicion that even diplomats have a difficult time being diplomats in the face of the inane, senseless, and ridiculous. I especially enjoyed hearing a former ambassador interviewed on NPR. He was asked if he thought that the sarcastic and caustic sentiments expressed in many of these documents reflected the true feelings of diplomats toward their counterparts in other countries. He tried to put a good face on it but when pressed admitted that it was probably pretty accurate. I realize that some national interests may have been compromised by leaking these documents but I got the distinct impression that the more significant result was the embarrassment it caused the diplomatic community. It was as if they thought that the average citizen was shocked by these revelations of diplomatic discord, that we were appalled that high ranking government officials would think of their counterparts as dweebs, dips, idiots, dorks or useless, mind numbing twits, that the Italian Prime Minister was the self-serving mouth-piece of Vladimir Putin who threw wild parties to gain favor with his constituents (Berlusconi denied that he had ever attended a ”wild party”) or that Angela Merkel was a Teflon queen who carefully avoided all confrontations in order not to find herself on the unpopular end of an issue. Come on folks, we are not shocked by any of this dirty laundry and all the official, diplomatic posturing with lots of huffing and puffing only makes it worse. Being a diplomat is tough, I get it. Having to look across the table at a complete dweeb and act like they are an engaing and intelligent person for the nation’s best interest takes real skill. Just don’t pretend that you live like a diplomat. It’s your job, not your life. A few glasses of wine later and you are ready to admit that you spent all day with a mindless twit. Most of us have done that a time or two, so we understand. We just don’t have to do it with someone who is insecure, angry and owns nuclear weapons. I am reminded of two great movie scenes. In The Last Samurai, Nathan Algrin is meeting his assigned translator for the first time. The translator told him that he was a failure as a diplomat in a country where no one actually said what they meant so he now accurately translated other people’s lies. In the movie Patton, Patton is sitting with a Russian general at a party celebrating the VE day and the Russian asks Patton to share a toast with him. Patton tells the translator to inform the general that he has no intentions of drinking with him or any other Russian SOB. Using the translator the Russian responds that he thinks Patton is a SOB as well. Patton agrees and they decide to toast, one SOB to another. I think a lot of diplomacy is like that too.